I had grand plans this morning. I was going to open up my various pieces of writing and send them off to sundry recepients from my agent to editors at journals near and far. Instead I’m sitting here feeling slightly paralyzed by my feelings about the attacks in Paris, and the response that has followed. I come from a family of gadflies who never seem to shirk from being contrary and annoying the powers that be if such is called for. We have, in whole or part, lost jobs, resigned jobs, taken jobs, been slandered in public fora, incarcerated, and received death threats for our points of view. And we are all writers. While we have cautioned each other to, maybe, “tone it down,” “be careful,” “watch your back,” or “trust nobody,” we have each steadfastly refused to take this advice. You can imagine, then, that the notion that ten writers and two body-guards could be shot to death during an editorial meeting, does not sit well with someone like me. I do not believe that murdering people, even those whom we consider to be foolish, lacking in judgement, and irrelevant to human progress (people who aren’t dissimilar to Fred Phelps and those within the Westboro Baptist Church), is a fair response to the incitement caused by their use of pen, pencils, and paper. 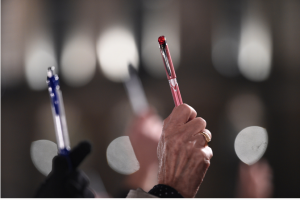 Last evening, I joined my fellow writers in signing PEN America’s condemnation of the attack on Charlie Hebdo. I did so even though I have been dismayed by the refusal of PEN America to make any statement about the conditions forced upon writers in Palestine, as they live under the yoke of occupation. I did so even though I disagreed with one part of the statement because in the end, I agree wholeheartedly with the idea that a punishment, or revenge, or any other human response, ought to be equal to the crime or offense. I do not pray to the god of the French, and much of America, whose devotees value a “free society” over human decency. I do not support the ALCU because I do not believe that the right to free speech on the part of one person overrides the right to grief and mourning on the part of another. The Westboro Baptist Church is simply wrong. And so is the ACLU for supporting it. The French Republic is founded on the guiding principle of laïcité (“freedom of conscience”), an idea that has seen an effective seperation of church and state. But look at that word, “conscience.” Conscience = a set of ethical and moral principles that controls or inhibits the actions or thoughts of an individual. As such, our conscience – whether it prompts us to attend church or mosque, or whether it urges us to stay away from such places of worship – defines our religion. France is no less dogmatic about its religion of “free speech” than is Catholicism about the ten commandments, or Islam about its One God. As I followed coverage last night, I became steadily more unhappy with the American take on the attack, even on the more left-leaning programs, such as the Rachel Maddow Show. Yes, the attack was vile, yes, nobody should be murdered for drawing cartoons, but no, thousands of people of the Muslim faith aren’t religious fundamentalists and zealots for marching in nations around the world, peacefully protesting the denigration of their faith. And no, seriously, no, lampooning your own politicians and dress-designers is not the same as expressing obscenities about someone else’s religion. We define what is considered criminal based on our own set of ideas, whatever our own culture has taught us to believe. Thousands of Muslims were outraged by the way Charlie Hebdo portrayed their faith and their God, and they were justified in their rage. Thousands in France and abroad were equally outraged by the outrage of the Muslims, and they, too, were justified in their rage. Each had offended the others religion. The protests that followed the satirical cartoons of the Prophet Mohammed in Charlie Hebdo in 2012 were an appropriate response. Intelligent people (both Muslim and otherwise), should have taken it further and exerted other pressures (diplomatic, cultural, conomic), in order to mitigate the fallout from the offense, had they felt it necessary to do so. Instead, one side picked up weapons, the other side claimed that “l’Amour plus fort que la haine,” but really practiced the opposite. It is tasteless to speak ill of the dead, but the anti-Muslim cartoons that made Charlie Hebdo infamous were similarly tasteless. They were designed to harrass, not educate. They were, in essence, cowardly, and masturbatory. No more elegant than men getting off on exposing themselves to children in public playgrounds. They were unnecessary, and made no contribution to civil society, to cultural understanding, or a collective human good. Cartoonist Stéphane Charbonnier incurred a great deal of hatred in his four years as Editor-in-Chief. And if he had not been killed so mercilessly, I would still be hard-pressed to imagine those four years as having been lived with genuine purpose. As the saying goes, we are put upon this earth to see each other through, not to see through each other. Charbonnier made it a goal in life to purloin the freedom of the press to report, and misused it to ridicule, malign, and nourish antagonism in a flammable world. I wish that the response on the part of the French to the bafflement and subsequent anger on the part of so many Muslims, had not been euphoria and condescension. I wish it had simply been an equally forceful ridiculing of an editorial vision that ran counter to creating a better, more peaceful world. I wish that goodwill and decency, not to be equated with censorship, had been considered an option. I sit here therefore, considering something both complex and simple. I wish for a world that understands that concession wins more ground than mockery. But I also wish that all of those people, including Stéphane Charbonnier had been given the time to do something different with their lives. Because the right to journey through life, to evolve, to realize the potential to do good in the world, is sacred. No resolution to be had, only thoughts and more thoughts. The pen truly is mightier than the sword. I wish for a better world, one in which people recognize and harness the power of that fact.